The refusal follows Khadki Ordnance Factory (OFK) under the Union defence ministry rejecting a similar plea seeking to know the quantum of sale of the anti-riot weapon pellet gun used by security personnel in J&K on grounds of what OFK called “national security and commercial confidence”. 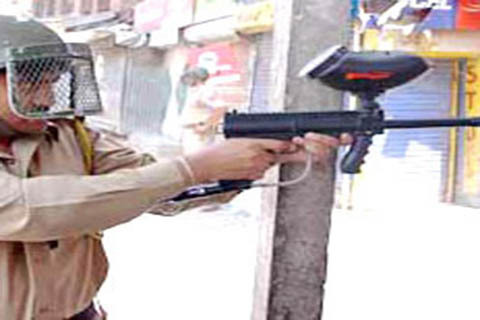 Nayak, who is with the Commonwealth Human Rights Initiative (CHRI), in his RTI application, had sought photocopies of the Standard Operating Procedures (SoPs) required to be used by CRPF to disperse stone-pelting mobs in J&K and of SoPs required to be used by CRPF to disperse large assemblages of people other than stone-pelting mobs in J&K. Filed last month, Nayak had also sought the name and postal addresses of the vendors from whom the anti-riot weapon and relevant ammunition were procured for use in J&K, and their quantity, since July 1, 2016. Nayak had further sought information about the number of CRPF personnel who suffered injuries while conducting operations in J&K, whether they were paid ex-gratia following injuries, and also the number of those may have been promoted to higher ranks in recognition of their performance. And finally, wondering how could CRPF reject information on promotions, Nayak recalls, on July 22, 2016, within two weeks of the eruption of unrest in J&K, a Board of Officers of CRPF recommended the criteria for awarding out of turn promotions to CRPF personnel who showed "extraordinary courage/displayed gallant action during fighting with anti-national/extremist elements."